Molly had her first sleepover Saturday. She had her friend Jordan, who lives behind us and has been in her class the past two years, join us for the night at our house. Molly’s been looking forward to this for a long time. We didn’t expect to have this happen during a huge snow storm, but thankfully we didn’t have any outdoor activities planned. Jordan arrived mid-afternoon and the girls played for a while. This included Leah, who was included in most things before bedtime. Then it was time to make dinner. 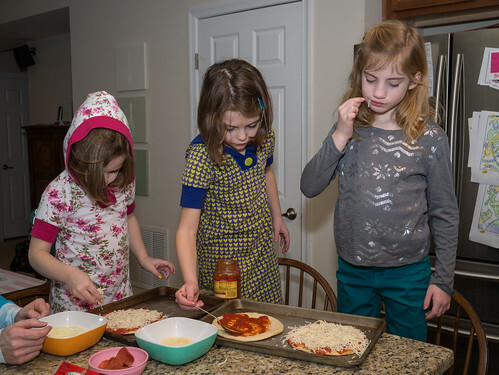 The girls made their own pizzas. Jen and I instead had one prepared by the gourmet chef DiGiorno. After dinner, it was movie time. The girls curled up on the floor to watch The Lego Movie for the millionth time. Jen popped them some popcorn and they had a grand time. After the movie, the girls headed to bed. Molly and Jordan got to sleep in the guest room, so they could have a room to themselves. Leah did not like this, but she managed to get a good night’s sleep anyway. Molly and Jordan slept very well, too. The next morning the girls got up, had breakfast, and played a bit before it was time for Jordan to head home. When that time came, she bundled up tight and headed home. She then trudged through the foot of snow in our back yard and up the hill to her house. Thanks for hanging out with us, Jordan! I was also finally able to complete the request of two little girls and make a Hampton hoodie for me. 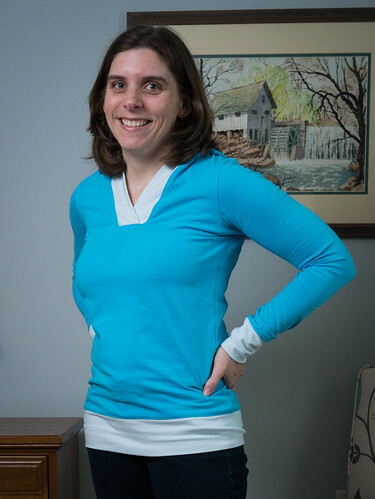 I was able to eek out just enough fabric left over from the above knit dress to make my hoodie. 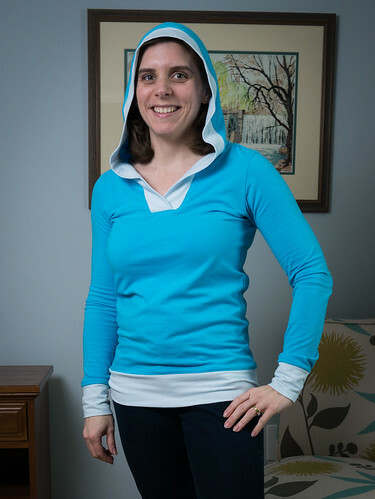 I had considered making mine all out of the light blue color (that I used to make Chad's), but then he reminded me that the girls would want us to wear our new hoodies together. So, no Sadie Hawkins matching shirts for us! 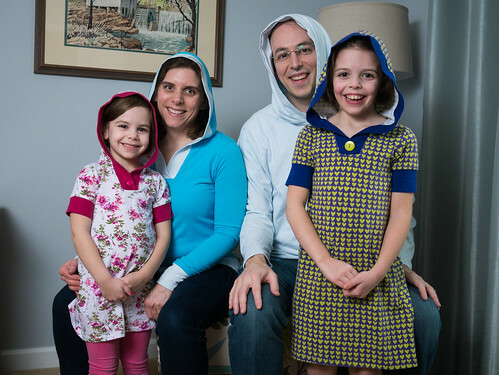 We can now all sport our new hoodies together! While we’ve had a lot of cold in January and February, we haven’t had much snow. Monday night gave us our first significant snowfall (about 5 inches). 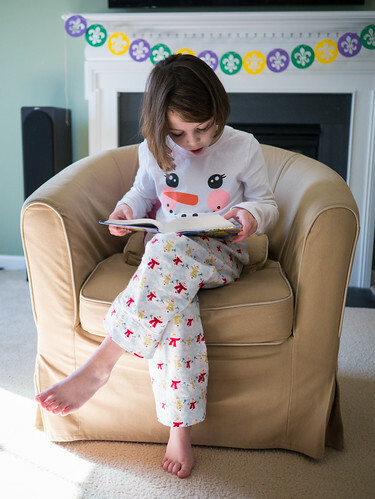 So, after having President’s Day off on Monday, Molly had a snow day on Tuesday. The snow was a very fine powder, the kind I imagine skiers love. 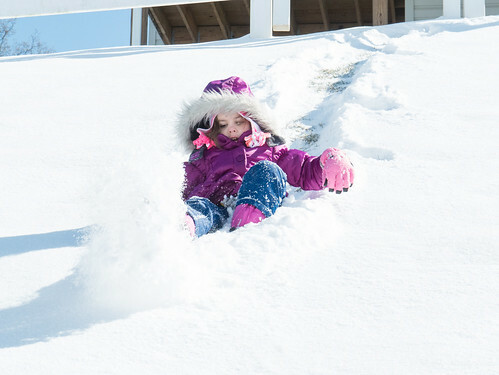 This is great for sledding (though not as great for snowmen who need wetter, stickier snow). The girls and I headed out for some fun on the hills in our side yard and our neighbor's yard. Here are a couple of the early runs. The powder meant Leah could kick up a real cloud of snow while sliding down the hill without a sled (as she is wont to do). 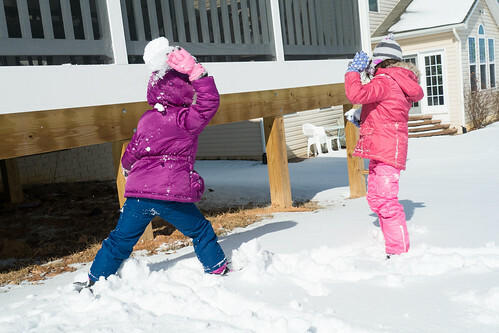 The powdery snow wasn’t sticky enough for snowmen and snowballs, but the girls made snowballs anyway. They wouldn’t stick together very long, so they could only be thrown from close range. After some fun, everyone helped out with the shoveling. 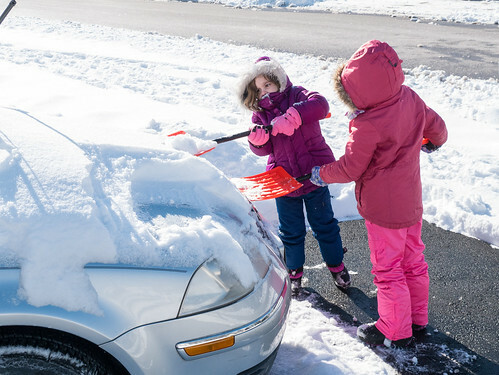 The girls were even kind enough to shovel off my car. Looking out the window as I write this, it looks like I’m in the middle of a snow globe. We may have waited a while for our first decent snow, but it seems to have only taken 4 days to get another one. 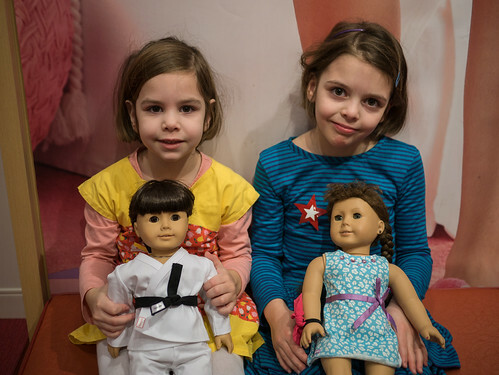 For the past year, Molly and Leah have been asking to visit the American Girl store. 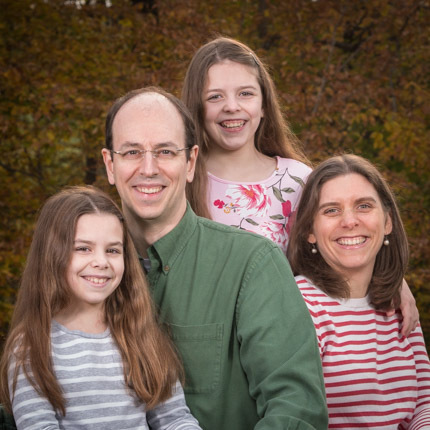 So, I surprised them and we followed our inner stars into the northern Virginia DC suburbs, along with Matilda and Ellie. 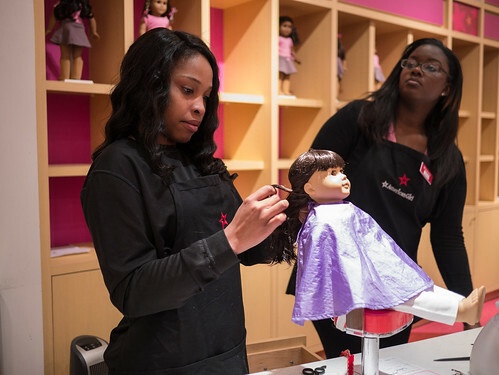 The store is two levels of dolls, doll cloths, girl clothes, and lots of accessories. Molly found a cute hat to model. I never thought I'd be taking my child’s picture in a bathroom, but I had to show how well thought out the store is. The bathrooms all included doll holders, in the stalls and by the sinks. 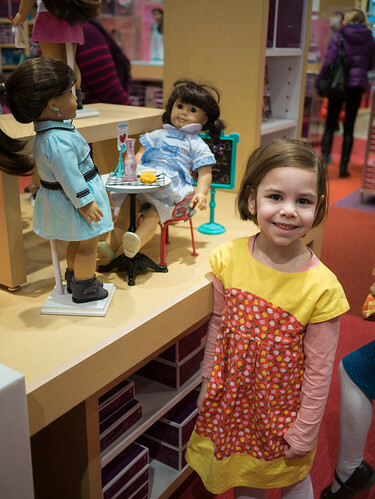 There are doll displays all over the store. Leah found a perfect place for Rose to have a chat with a new friend, Grace. Apparently Grace is a friendly girl because Molly McIntire needed to meet the new Girl of the Year too. 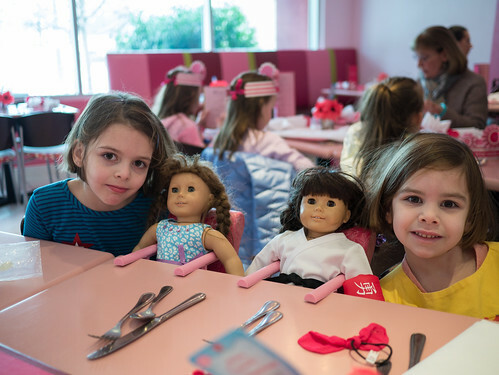 While there, we also had lunch at the Bistro, complete with seats for the dolls at the table. Each doll was presented with a tea cup and saucer, because dolls get thirsty at lunchtime too. 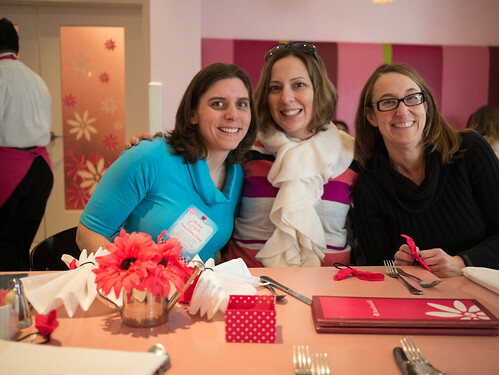 Molly did a nice job of documenting that Stacie, Julie, and I enjoyed the day as well. 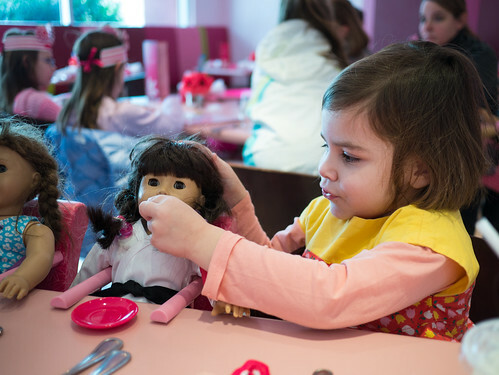 After lunch, Molly McIntire and Rose were treated to an afternoon at the doll salon. 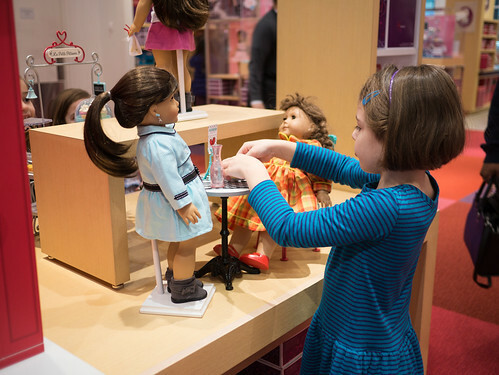 I was happy that someone else was brushing the dolls’ hair. 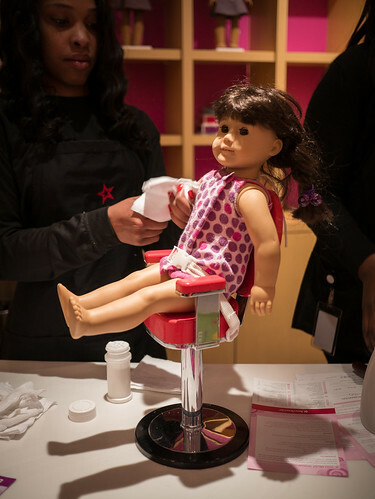 The dolls also had a nice spa treatment, including a cleaning, massage, and nice smelling powder. 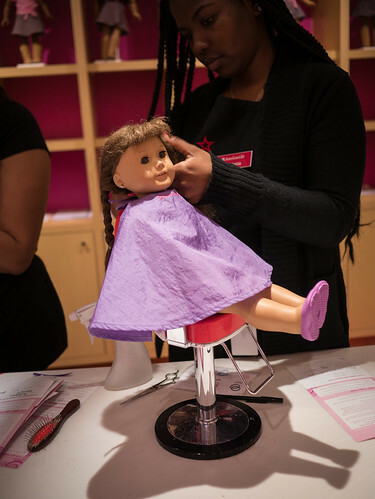 Leah chose a fishtail braid for Rose, who sat very patiently to have her hair braided. New hairstyles, a spa cleaning, and new clothes. I’d say Rose and Molly McIntire had a great day. Oh, Molly and Leah loved the day too! On Saturday night, we had a bit of snow and a lot of wind. Sunday morning, the snow was still on the street. While it wasn’t much, we’d had 3 vehicles lose control on the very steep hill we live on during the last snowfall, so we decided not to chance driving to church. Instead, we held church at home. I led some songs (both some "big church" songs and some children’s church songs). Molly led the scripture reading. Leah led the prayer. Apparently, she thought she needed to sound different when praying for the service instead of her usual prayers, so she threw in lots of amusing parts. These included praying “for all the people’s issues” which is a phrase I’ve never heard her say before. 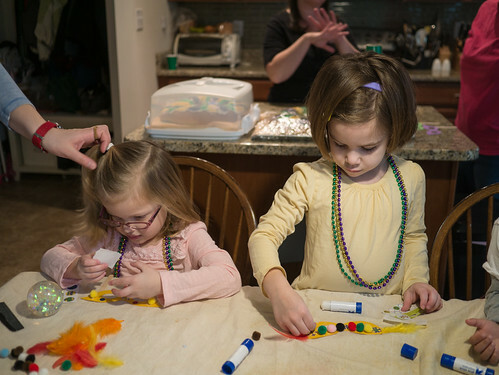 King cake, beads, and New Orleans jazz…all the goodies that Mardi Gras has! I hosted our annual Mardi Gras party last Thursday. 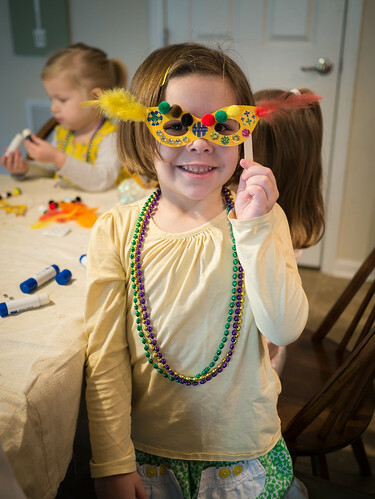 While I was in Louisiana last month, I picked up a new Mardi Gras book, so I read to our guests about the traditions of Mardi Gras and then the kids enjoyed making their own festive masks. We also had a King Cake bake-off. 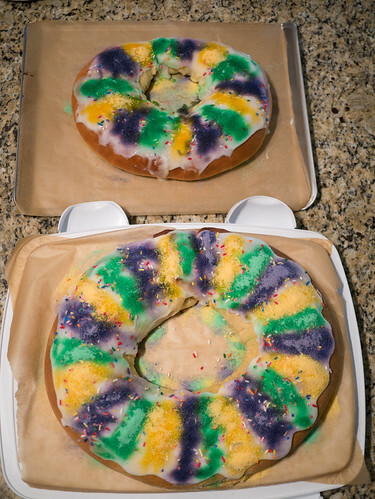 I made two king cakes from two different recipes. The smaller cake is a recipe I've been using for many years. The larger cake is a new McKenzie’s King cake copycat recipe that a high school friend recently shared. The only difference was the dough; the cream cheese filling, icing and sugars were all the same. Many of the adults at the party tried both and voted. The larger cake was deemed the winner; the dough was more pastry-like and as Chad commented, "It's closer to what I think of when you say King Cake." 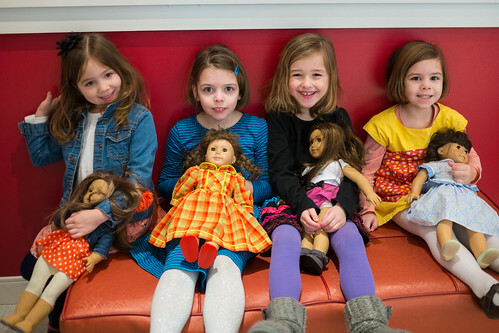 Leah loved having her preschool friends over to celebrate. Happy Mardi Gras! 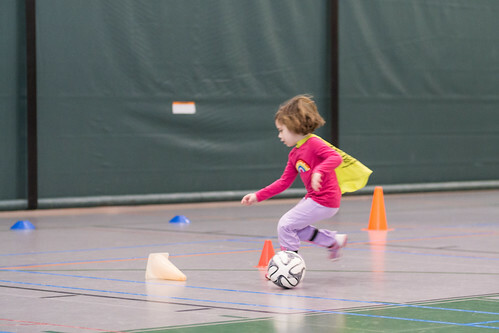 Leah has taken up soccer this winter. 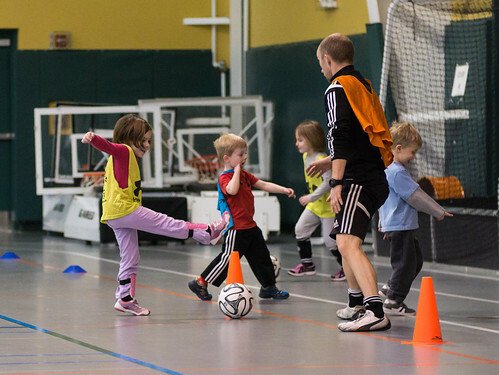 Since outdoor soccer in the cold/snow/ice is a poor plan, this is of course indoors. Here she is knocking over cones as she pretends to be the Joker (the other team was Batman, who had to pick up the cones to fix the city broken by Joker). 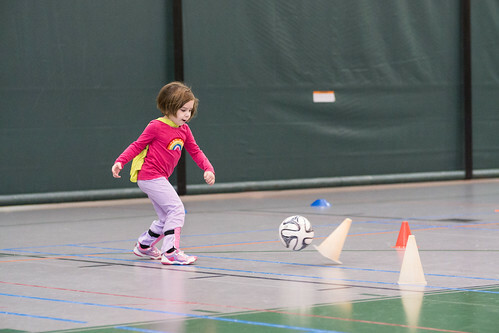 When Leah picked soccer, she said she wanted to do it with “the people who talk funny”. This meant she wanted soccer with UK Elite, where all the teachers are from the UK. 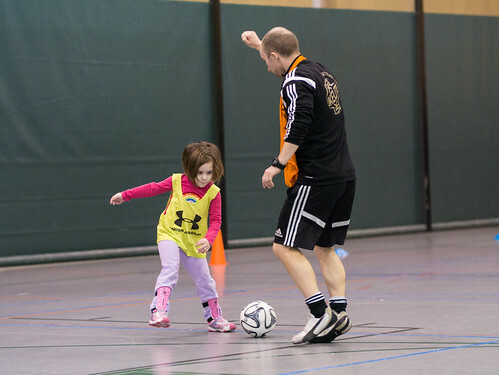 She loved soccer with them this past summer, and it’s just as much fun indoors in the winter. Here she is trying to hit Syndrome (played by Coach Ian) with a fireball to stop his evil antics. Leah’s moving as fast as Dash. Too fast for any camera. This week, Leah’s choir sang in church. And not only did they sing, they also played choir chimes. I’ve been leading music at Children’s Worship at our church. We do it once a month at 11:00. 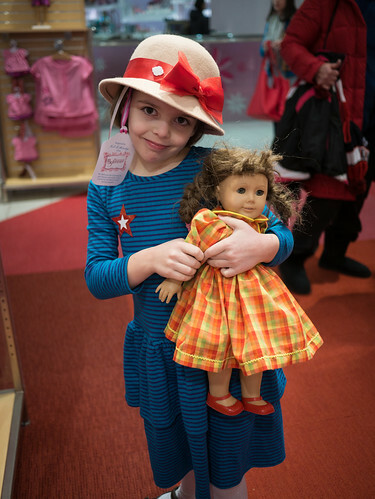 This month, Molly helped out by singing the special music. Note that this was the same day that she sang with her choir at the 9:30 service, thus marking the first time she’s been involved in back-to-back services. Molly’s choir sang in church last week at the 9:30 service. Apologies for the video difficulties. I got a good seat up front to shoot it, but ended up right behind the director. I tried my best to duck around him.